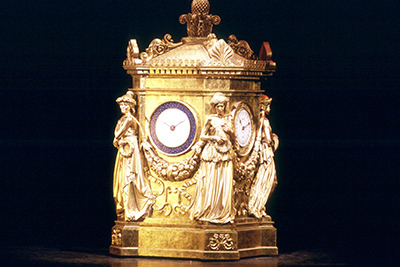 The Pageant of the Masters is a 90-minute theatrical performance where famous works of art are brought to life onstage. A live narrator guides the audience through the story of each piece, complete with music by a full orchestra. The Festival of Arts Fine Art Show features works for sale by 140 Orange County artists. The art exhibit also includes art workshops, tours, live music, special events and more. 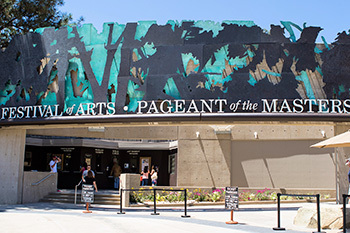 The Festival of Arts and Pageant of the Masters is located at 650 Laguna Canyon Road, Laguna Beach, CA 92651. More information on directions and parking. We have two on-site restaurants located on the Festival of Arts grounds. 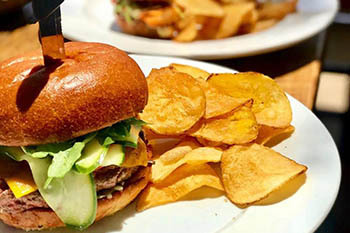 Terra Laguna Beach is a sit down restaurant (reservations are recommended) and Gina’s Alfresco is a walk-up window. You’re also welcome to bring in your own snacks and beverages, however coolers, picnic baskets, or any other containers should be no larger than 14”x14” in size. Guests 21 and over are also permitted to bring their own alcohol, however the Festival of Arts reserves the right to deny entrance or eject anyone who appears intoxicated. Please enjoy your alcoholic beverages responsibly. Glass bottles and containers are not allowed in the Pageant amphitheater. For a full list, see our House Rules. Arrive Early and Enjoy the Festival Art Show! Laguna Beach is a popular summer destination which leads to increased traffic and full parking lots. The best way to avoid the stress? Arrive early! There’s plenty to see and do at the Festival Art Show before the Pageant. 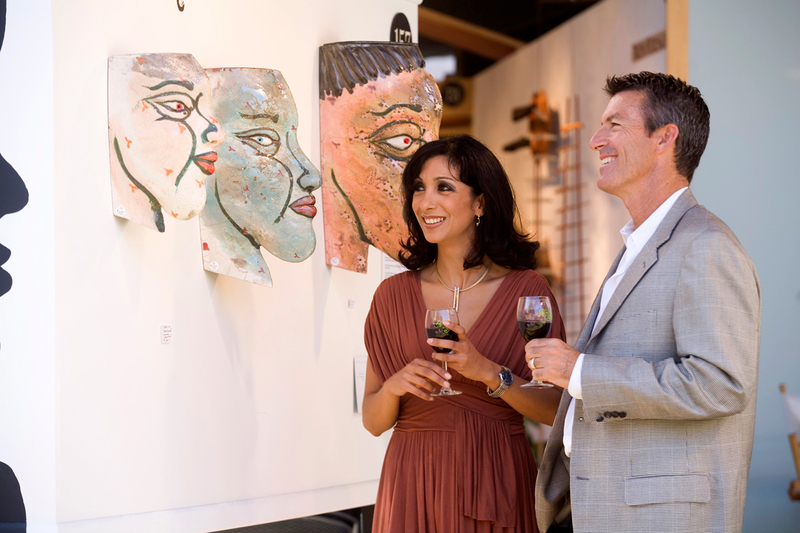 Peruse the art show, create art in our workshops, enjoy a glass of wine, dine at one of our restaurants and enjoy a live concert! Plus, we’re only 5 minutes walking distance from downtown Laguna Beach. Although you might think sunny and warm Laguna Beach weather, be prepared for the temperature to drop when the sun goes down. We’d suggest bringing a blanket or sweater with you or purchasing one from our gift shop. You may also rent binoculars and seat cushions on site. Jackets and blankets are available to purchase at our gift shop next to the front gates. As a courtesy to our volunteers and the surrounding audience, please refrain from talking during the performance. Silence or turn off all electronic devices, including cell phones, beepers and watch alarms. If you need assistance during the show, please go to your nearest usher or security guard. Be polite to all fellow patrons and Festival/Pageant staff. 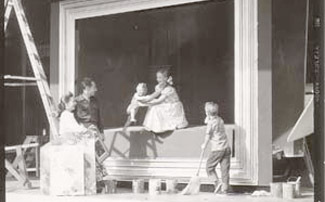 No photography or audio/video recording of any kind are permitted during the Pageant. See a complete list in our House Rules. Found a piece of art you love? Wonderful! If the artist is there, you can purchase directly through them or speak with our art sales consultant located in the Festival’s gift shop next to the front entrance. Get the most out of your visit by taking a free exhibit tour! Our friendly Festival docents will take you on a fun and informative walk through the fine art show. Offered twice a day- weekdays at 2pm and 4:30pm and weekends 11am and 4:30pm. 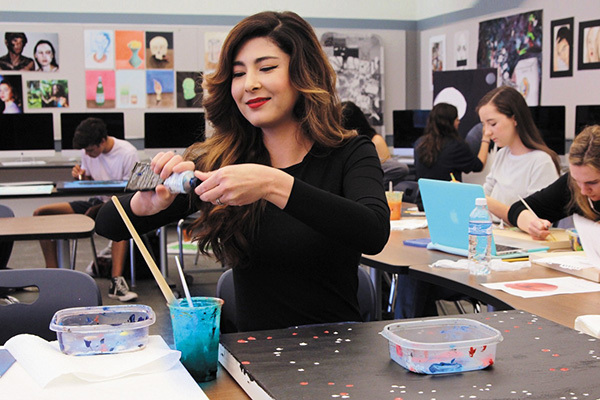 The Festival of Arts offers daily drop-in workshops in the Art Center. 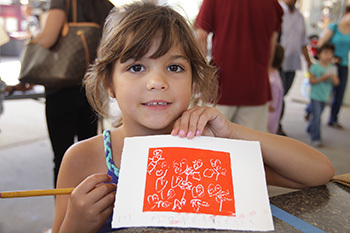 Printmaking and mixed media workshops are free. Paint a pot at our ceramics workshop starting at $25. Our helpful art instructors will walk you through each step. Want to dive deeper into the creative process? Sign up for one of our art classes! The workshops in our Art Center (see above) are open to all ages. During the week, parents can also sign their children up for our Youth Arts Education classes at 1pm and 3pm. For the little ones, join us Mondays at 12:30pm for Art & Story Time with activities for children 5 and under. Please keep in mind, a parent or guardian must remain on the grounds while their child is participating in any of our classes. 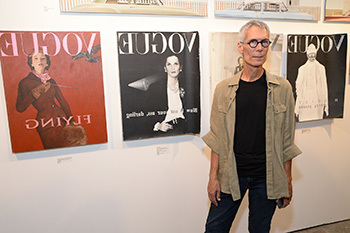 Photographing artwork at the Festival of Arts is prohibited without the artist’s permission. Not only is the Festival of Arts renowned for its fine art show, but it also plays host to a plethora of special events all summer long. Also, join us nightly at 5:30 for live music on the Festival Green.